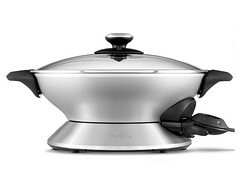 The Breville® Hot Wok™ BEW600XL — Searing high-wall heat wok that works just like a traditional iron wok on a gas range. 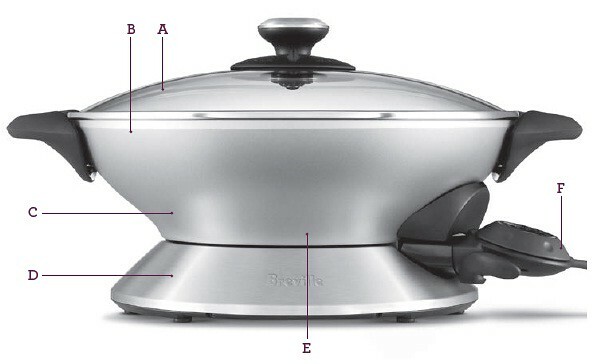 Butterfly Heating element evenly distributes heat up the high wall to 425°F (218°C), bringing real Asian flare to the at-home kitchen. A. Cook 'n' Look Lid. B. Quantanium Non-Stick Surface. C. Wok Bowl. D. Wok Base. E. 1500 Watt Heating Element. F. Temperature Control Probe.